Next meeting coming up on Saturday! We’re getting back up to speed with Rally organising after the Christmas break, and our next meeting is coming up on Saturday 17th Jan – all are welcome downstairs at York Bike Shed on Micklegate, York at 10AM. Newcomers are especially welcome! Many thanks meanwhile to everyone who has joined the Friends of York Rally to support the Rally’s revival. Our treasurer Rachel reports on Facebook that we’ve recently added the 150th member! We’re also past the 100 mark for campsite bookings – but our target is 500+, so there’s a way to go yet! Earlybird prices are still active, so please do book now if you haven’t already! On the website front, there’s now a new page under the ‘Visitor information’ menu for the 2015 Rally, detailing all of the displays and activities confirmed so far. There should be plenty of other progress to report after the meeting – will update this site ASAP! 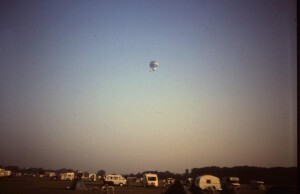 As yet, we can’t promise a hot air balloon as shown in this image from 1995. Balloons are still launched regularly from the Knavesmire (and there’ll be space for this even with the Rally running), but whether we’re treated to the sight will depend on wind and weather.